We have been collecting for Keep a Child Warm far and wide this year. My travels over the last few weeks have taken me to Northampton, London, Torquay and Wales! Schools in Northampton have been so supportive of our KACW initiative. Just in the last month we have collected from Earl’s Barton Junior School, Manor School Sports College and All Saints CEVA Wellingborough. There have been so many more schools involved in the collections in Northampton and we are so grateful for you involvement. I also collection donations from Bevan Lodge Pre-School and Manor Infant School in Farnborough. Amy and her husband did an amazing job storing the snow suits, boots, coats and many other warm items. Amy’s mum has also knitted a number of really cosy hats, we’ll keep our eyes open for those during the distribution. Thank you guys! The next stop was Torquay to collect over 200 pairs of shoes. These had been given a temporary home for the last few years in a basement after the local shoe shop closed down, however we think they would be much happier on children’s feet. Thank you Paul for their temporary home. 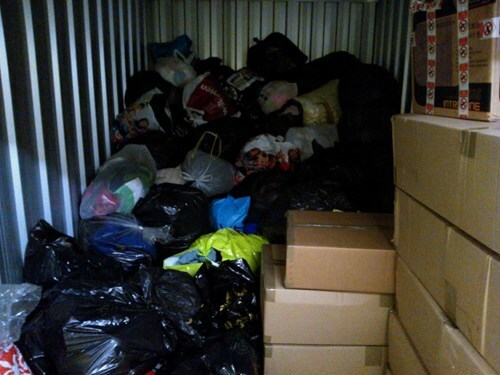 The storage is filling up at Big Yellow, Nottingham and we are so grateful to them for helping us out with our second 100sq ft room (which is fast filling up!). We are also hugely grateful to East Mids Van Hire who are doing a fantastic job keeping out transport costs as low as they can. Thanks guys!